For her first solo exhibition at Carrie Secrist, Carson Fisk-Vittori has assembled a sharp collection of photographs – arrangements of ultra-faux still lives, as well as groups of combines, ready-mades, and assembled sculptures evocative of tableaus. The compositions within the work feature found objects within the context of product display. With a robust sense of humor, and a nod to the codified attitude of the marketed California lifestyle, Women Weed & Weather gestures to definitions of the iconic, both in popular culture and art history. Through the title of the exhibition, lifted from Kendrick Lamar’s summer chart-topper, the three referenced categories are used to re-orient definitions; women are turned instead toward typically “feminine” products; drugs into the invasive species; and weather conditions into a more controlled interior atmosphere. 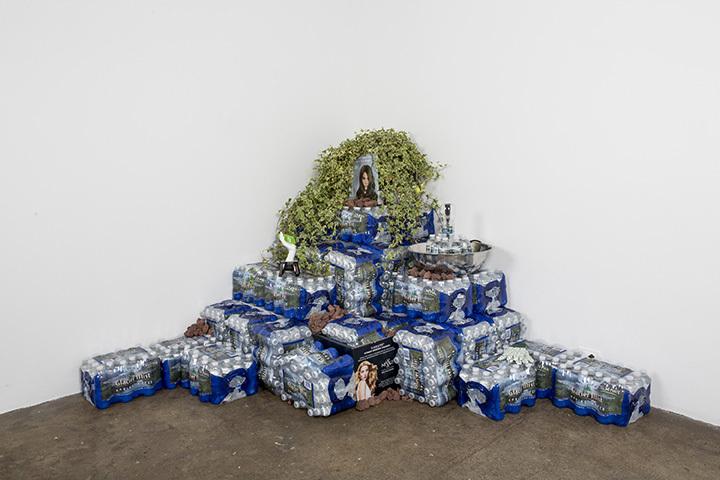 In Glacier Mist, a pyramid display of packaged and cased water bottles, the installation occupies a corner of the gallery space, complete with printed fashion advertisements, compositionally scattered among the live ivy and lava rocks that also occupy the piece, as if to create a type of living scenery. The piece itself, while essentially built out of water, even if somewhat abstractly, also contains a literal fountain that pulls its stream from the water bottles themselves – creating a dynamic landscape that speaks to more minimal graphics of screensavers and desktop computers, as well as an artificially marketed view of the Zen lifestyle. Carson Fisk-Vittori, Glacier Mist, 2013. Bottled water, fountain, rotating display, ivy, lava rocks, hydro-spike, and other artifacts. 84 x 80 x 48 inches. Photo: Sara Condo. All images courtesy the artist and Carrie Secrist Gallery, Chicago. References to the digital screen proliferate the exhibition, combining the immaterial expectations of photoshop and tumblr aesthetics, while subverting these potentials with physical ephemera and older, earlier forms of turn of millennial technologies. 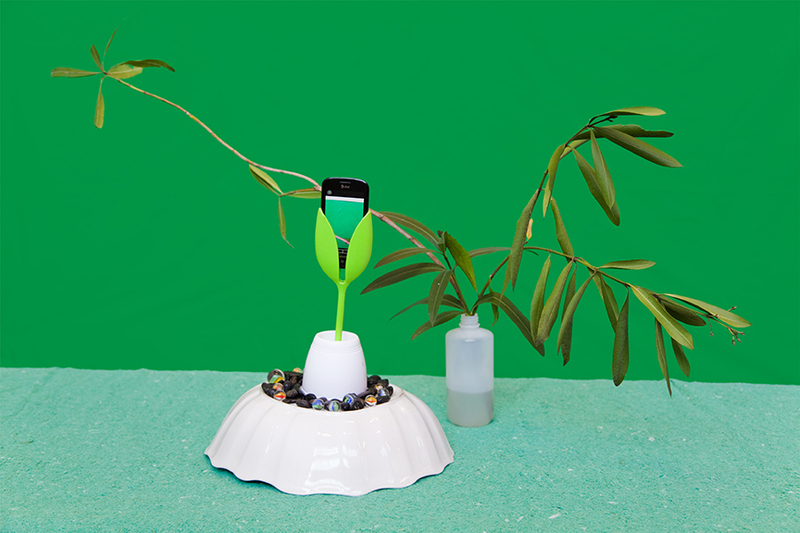 In Nature Window, a predominantly green inkjet print is hung on a wall of the same color – evocative of the green screen, the objects pictured within the piece include (most importantly) the camera of a cellphone positioned so that the lens is also facing the green backdrop of the still-life. The piece stages a once-removed image of our perspective, belonging not to the objects themselves, but the screen interpretations of those objects; diluted, desaturated, and never quite as nice as the quality of the thing itself. Edition of five and one Artist’s Proof. All images courtesy the artist and Carrie Secrist Gallery, Chicago. Opposite to this installation, is a wall painted hyperlink blue, with Squiggle and Tube, hung just to the right margin of the wall. 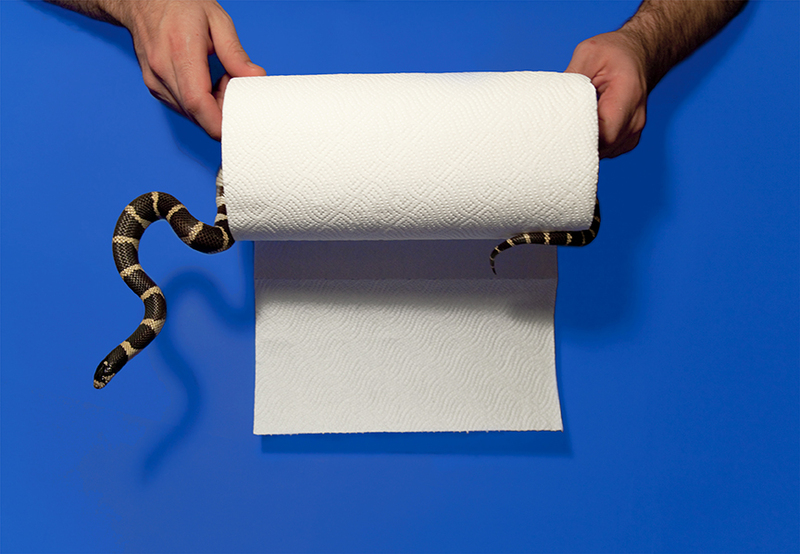 The photograph depicts two hands holding onto a roll of paper towel – no doubt the same kind used to absorb different quantities of blue liquid in commercials – with a black and yellow snake threaded through the cardboard tubing of the paper. The wall itself operates as a composition ­– in the upper right hand corner of the wall hangs another crawling ivy plant, hung upside down, and seemingly watered by a bottle of evergreen Lysol. In this iteration, the household products are paired household objects of the same formal qualities – an arbitrary exercise, though with a certain degree of self-awareness that, instead of becoming predictable, remains poignant and humorous throughout the exhibition. The work gives the illusion of being sponsored by one of the many manufactures featured – brought to you by Garnier! brought to you by Schick! – forging a connection between domestic objects and personal grooming. With a multiplicity of shaving products and hair care items, the repetitive appearance of razors strongly suggests a deadpan relationship to landscaping, equating personal priming phenomena with the outdoors. 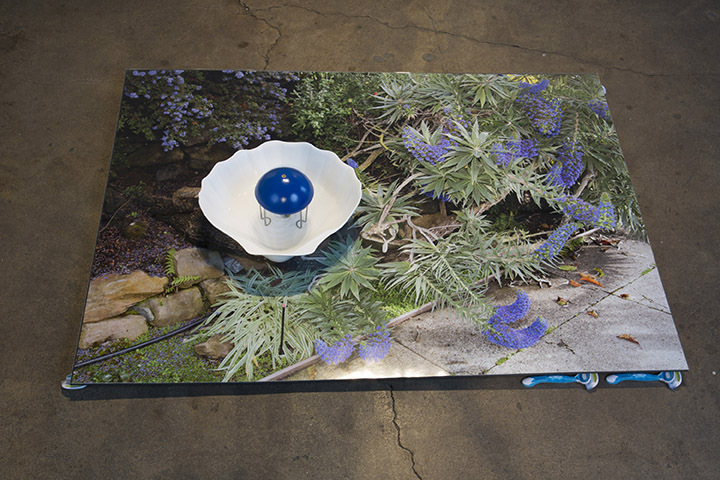 This is the case in Lost in the Irrigation Aisle, a print of an average garden landscape, perhaps even lifted directly from a Home Depot catalog, that is presented on the floor, held up by a series of blue Schick Hydro Silks. Or Rain Showers Torrential, where grey plywood forms are hung on the wall – a circle and a triangle – carrying a can of pink Raspberry Rain Skintimate, or Windshield Display, suspended on bottles of affordably prices shampoos and conditioners. Carson Fisk-Vittori, Lost in the Irrigation Aisle, 2013. Archival inkjet print, razors, shell bowl, and water wiggler. 36 x 48 inches. Photo: Sara Condo. All images courtesy the artist and Carrie Secrist Gallery, Chicago. For Fisk-Vittori, the overabundant use of floral motifs and household products is one key way in which the average consumer looks, without really seeing. In this sense, plants merely become the product of visual fodder, colors, and forms, which are extrapolated and re-appropriated in ways that take advantage of the viewer’s weakness for all things seemingly natural. Women Weed & Weather runs at Carrie Secrist through January 4, 2014. MK Meador is a writer and curator living in Chicago, IL. She is currently on the curatorial panel of the Comfort Station in Logan Square and HATCH curator-in-residence for 2012/2013. December 12, 2013 | Filed under Featured and tagged with Carrie Secrist, Carson Fisk-Vittori, MK Meador.